More Lipshutz & Hyams Fiction! Neither Lipshutz or Hyams are averse to a little fabrication, or manipulating the truth. In plain English, residents are fed a bunch of furphies designed to mislead and to portray VCAT as the single arch villain. As we’ve repeatedly stated, scapegoats are necessary in order to deflect attention away from council’s inept planning and the decade long failure to implement promises, consult with the community, and to undertake any strategic planning that is worthy of that name. The claims made by both Lipshutz and Hyams simply do not stand up to scrutiny. Here are their bogus claims, from individuals who would certainly know better given their legal backgrounds and the length of time both have been on council. VCAT members are ‘nameless/faceless’. Wrong, wrong, wrong! Each decision carries the name of the member – which by the way is far more ‘transparent’ than many council reports that remain ‘anonymous’. A full list of vcat members is available plus the criteria for their selection. Again, far more transparent than this council in regards to its staff, and especially in regards to the continued contract extensions for the CEO! Site inspections were not carried out on the decisions in question. Dead wrong again. The date of each tribunal visit to the site is listed in the decision itself. In fact 99% of all VCAT decisions involve site visits and often commentary of what the member observed. The prize for sheer hypocrisy however goes to this line – ‘we as councillors and residents know what the area needs…’ .. Given that the zones were introduced WITHOUT WARNING AND WITHOUT CONSULTATION clairvoyance and mind reading is another highly developed Lipshutz skill! Two VCAT decisions are the focus – one in Bent St McKinnon and the other in Orrong Cresc, North Caulfield. Council had granted the latter a permit with conditions such as lopping off one storey to 3 – despite the fact that it was zoned as Commercial 1 – and numerous other contradictory impostes that the member basically threw out because they simply didn’t make any sense. 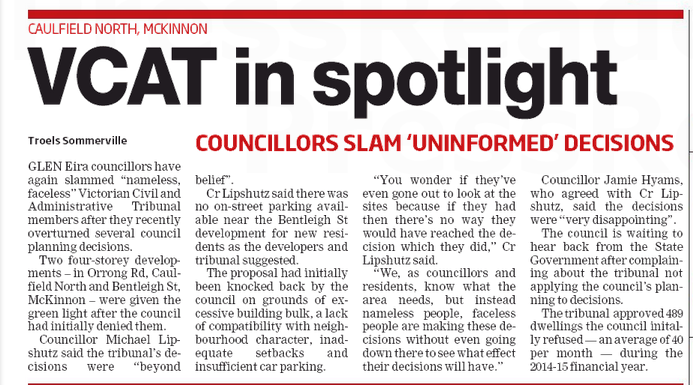 VCAT has its faults clearly, but when judgement after judgement criticises council for its lack of policy, or nonsensical demands, or points out the multitude of loopholes in the planning scheme and council has done nothing to address these, then VCAT is not to blame. It is this administration and its lackey and deliberately misleading councillors. Here are some telling extracts from these two decisions. Readers should compare these with what Lipshutz and Hyams have stated and draw their own conclusions as to the veracity of the claims. It is important to note that this policy is not about respecting the existing neighbourhood character. There is no preferred neighbourhood character nominated for housing diversity areas. For residential development, it is about scale relative to the commercial centre, for it not to dominate the streetscape, and promotion of site consolidation to maximise development opportunities. The site is not near a Neighbourhood Residential Zone. There is no issue of transition of scale against a lower intensity residential zone. It is comprised of two lots, a consolidation of site encouraged by the schedule of the zone and Clause 22.07 to maximise development opportunities. My inspection of the site reveals that recent development in McKinnon Road is three storeys, also with four storeys, the (e)merging scale of this activity centre. The proposal is in essence a three storey building above a basement. The top floor is recessed from the two lower floors. This is not a building mass that would dominate the streetscape of Bent Street. The size of the land, particularly the combined width of the two lots, enables a wider and larger building to facilitate a three storey building bulk that can meet the side and rear setback standard (B17) of Clause 55, which would otherwise be impossible or difficult to achieve on a single lot. I am satisfied that the scale and massing of the development responds appropriate to the emerging character of the McKinnon Neighbourhood Centre, and as a response to the zoning and policy for the site. With regard to side and rear setbacks, Council conceded that the non-compliance is minor, and recommended that the building be pulled back against 62 Bent Street to the south for increased in ground landscaping. The building meets Standard B17 except Bedroom 2 of apartment 2.03 on the top floor facing north. I agree with Mr. Pitt that not meeting this standard is acceptable, as there is a buffer between the review site and the rear of No. 170 McKinnon Road to the north by a 3.05 metre wide laneway. This means the building mass has the benefit of a 3.05 metre wide separation from the north. The decision guidelines of Clause 52.04-1 specifically gave consideration if a site abuts a laneway. ….there has been a change in planning circumstances, notably the zoning of the land has changed from Residential 1 Zone to the current General Residential Zone Schedule 1, which contemplates more intensive development where height of building can be 10.5 metres and up to 11.5 metres on a slope plus promotion of site consolidation, compared to the maximum height of 9 metres recommended in Clause 55 for the Residential 1 Zone. Conditions 1(a), (d), (j), 36 and 38 are deleted. Commercial 1 Zone and no overlay. Condition 1(a) requires deletion of the third floor (top level) and the roof replaced by a style that is consistent with the architectural style of the building, and which may include pitched forms. This condition was not a recommendation of Council officer’s, and has the most severe impact on the yield of the development. Condition (d) requires additional setback of the third floor. As this condition is to require further setback of the top floor which is required to be deleted, it contradicts Condition 1(a). As for policies, there is common ground that the site is not specifically covered by a policy that relates to a site in a Commercial 1 Zone and which is not part of an activity centre. The site is in the Commercial 1 Zone, and the existing building has been a commercial building for many years, decades before planning controls. As for the notion that the site should be treated as if it is in a residential zone such as the Neighbourhood Residential Zone as its surrounding properties, it is not so in fact or law. This condition requires gates and steps in the terrace/outdoor spaces of units 1, 2 and 3 on the ground floor to provide direct pedestrian access from Orrong Crescent. These three dwellings are ground floor units and accessed from an internal corridor instead of from the street. This elevation (north) of the building is constructed to the street boundary, with recesses in the form of balconies. The ground floor of these dwellings is elevated above the footpath level by about 1.9 metres (scaled). To comply with this condition of providing stairs and gates directly from Orrong Crescent by using the terrace/outdoor space, it means the balconies will be reduced substantially in size, leaving little room, if any, for it to function as the private open space of these dwellings. A third possible intention is to ensure that each dwelling has its own identity when read from the street. I agree with the notion that a direct entry would achieve such an end. In this case, the cost is to sacrifice the private open space for these dwellings. On balance, the loss of the only private open space and hence reducing the internal amenity outweighs the benefits of direct entry. This condition will be deleted. A really good point Aleck. Councillors can say and do whatever they wish with impunity. No other councillor calls their bluff or pulls them up and the Leader blindly publishes the lies without checking the facts. A poor show all around. The Leader prints whatever the press release says. These press releases is authored by the town hall staff. The Leader will continue to print verbatim as long as the Glen Eira Council keeps up the advertising. Did any other Councillor/s comment on VCAT decisions? We have been to vcat twice fighting awful overdevelopments that council let have permits. It is totally discouraging to sit and listen to the developer saying that everything he is doing is according to the planning scheme and the chair agrees with this. The planning scheme has to change. If it doesn’t then residents can look forward to many more developments that take away all amenity and turn neighbourhoods into ugly boxes. I also think it is dishonest for these councillors to spew forth such unfounded views. I’d like to ask these two long serving councillors what they have achieved as councillors to ensure that the amenity of residents has not deteriorated because of their lack of attention to good planning. These guys are just pathetic. Sloppy work by council. Should not require a rocket scientist to figure out that one condition contradicts another. Methinks the approach is to include as much verbage as possible in the hope of confusing everyone. Nevertheless, they confuse themselves. How much are we paying these bozos? Unbelievable. The other councillors must be blind and stupid to let them abuse their authority for years to serve their community and their community with the decisions they make. who is at fault? those that elect them time after time. not me and you, but a majority!!! If Council was serious about planning outcomes, it would be busy introducing amendment after amendment to tighten its Scheme up so that VCAT had less freedom to set aside Council’s decisions. I don’t recall any councillor requesting a report for possible amendments in response to each defeat at VCAT. The overwhelming impression is that Council is happy with the situation.